In 2008, a team of researchers exploring the Japan trench with a remotely operated vehicle filmed footage of the deepest-known species of fish. 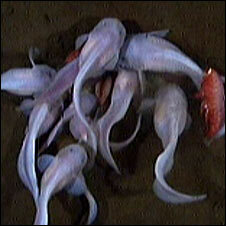 The fish, known as snailfish, had never been seen alive before. Scientists had only five pickled specimens that had been dredged up from the deep and preserved for study. The biologists who discovered these live fish had expected to find fish living at these extreme depths (25,272 ft) to be very slow and sluggish to conserve energy in this extremely low-energy environment. But the video clearly shows a large group of them very actively moving and feeding. Because the fish live in complete darkness, they use vibration receptors on their snouts to navigate the ocean depths and to locate food. Their eyes appear to be virtually nonexistent. Eyes in most organisms are designed for gathering light in the creature's visual field and transmitting it to the brain - giving it useful information about its environment. In a world where no sunlight ever penetrates there's probably little use for eyes. The researchers on this project have said they expect to find fish living even deeper than these! The Hadeep project, which began in 2007, is a collaboration between the University of Aberdeen's Oceanlab and the University of Tokyo's Ocean Research Institute and aims to expand our knowledge of biology in the deepest depths of the ocean. The researchers have been looking at the Hadal zone - the area of ocean that sits between 6,000 and 11,000m (20,000-36,000ft). It consists of very narrow trench systems, most of which are found around the Pacific Rim.